Anne Frank’s Diary , claiming to document the period 12 June 1942 – 1 August 1944, is really a collection of letters to eight imaginary people, sketches and fictional stories. 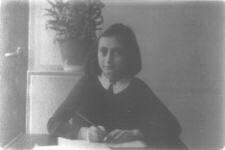 The collection was supplemented and rewritten when Annelies Marie Frank decided to write a novel in 1944. In 1945-6 Otto Frank prepared at least four typescripts claiming he did not intend to publish it. Since its first publication in 1947 as Het Achterhuis , the ‘diary’ has sold 25 million copies and spawned an industry of Foundations and travelling exhibitions. When in the entry of 29 March 1944 AMF described her book as a novel (”een roman“) this was incorrectly translated in the Diary to ‘a romance’ (entry for 29 March 1944). The author lived just a short walk away from Prinsengracht 263 and was twice deported from Holland for handing out leaflets outside. His detailed and often humorous debunking of the Diary finally and irrefutably blows the whistle on the ‘Anne Frank Roadshow.’ Anna Frank’s Novel: The ‘Diary’ is a Fraud by Simon Sheppard, 50 pages, 13 tables, 3 figures, ISBN 1-901240-07-X, 1998.
Who – or What – was Kitty Franken? We’ll order 50 lb. of flour from Siemons, 60 lb. of grain is already in the house, ground and in good condition. Let’s ask Jan for another 10 lb. of peas, we already have 70 lb. of brown beans, 10 lb. of peas and 5 lbs. of marrow peas. 50 tins of vegetables, 20 little tins of fish, 40 little tins of milk, 4 kilos of milk powder, 3 bottles of oil, 4 preserving pots of butter, 4 preserving pots of meat, 4 pots of marmalade, 60 preserving jars of fruit, 20 bottles of tomato soup, 10 lb. of rolled oats, 8 lb. of rice, and no sugar... We have satisfactory coal and firewood in the house; as far as possible plenty of candles... We also still have 1½ hectolitres of winter potatoes in the back spice store. To take just one example of conditions outside Jan told us what he had eaten since Saturday. On Saturday he got 3 big carrots, Mrs. Pfeffer or he himself I don’t know which cooked them with green peas and that was the meal for Saturday, Sunday and Monday. On Tuesday some marrow peas came on the table and on Wednesday the left-over carrot was cooked in a hash. One can only guess at the cumulative effect of millions of adolescent girls in particular tearfully reading the Diary at their most impressionable age. The nature of its influence need not concern us here; the fact is that it is false, and based on deceit.